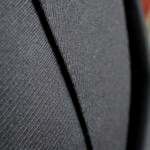 My Chittleborough & Morgan navy suit was finally ready last month, and here are the pictures. I use the shot of the back at top because it is the only one that demonstrates the superb fit Joe and his team have achieved. It is a consistent struggle for tailors to get the fit right through my hollow lower back and fairly prominent seat. The only other tailor that I think achieved such a good fit here was Liverano & Liverano. My favourite style aspect of the suit is the waistcoat – a new design that Joe was trying out. It has a cloth back and a proper collar, so it can be popped up if the air turns chilly. 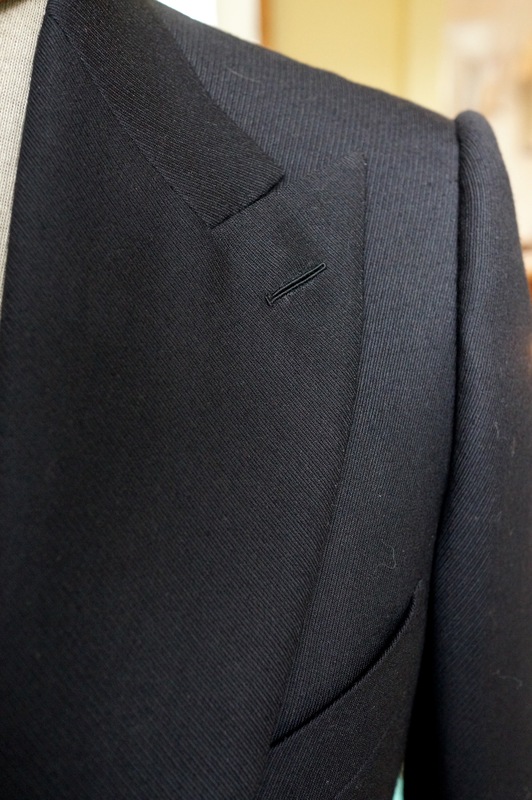 And it is cut so that the lapels fasten together, using the usually decorative lapel buttonhole. For someone who still likes the Logical Waistcoat Theory he penned 5 years ago, it is an extremely functional piece. The make, as you should expect by now from Chittleborough, is superb. The best by an English tailor and approaching the French masters at Cifonelli and Camps de Luca (more on a comparable Cifonelli suit next week). 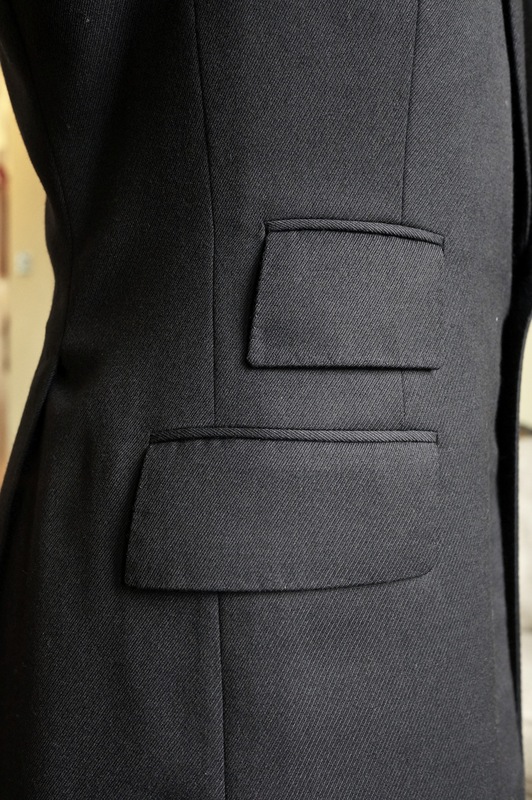 I mentioned the way the C&M pockets are tacked to the inside of the jacket in a recent post on The Rake website – as well as the hand stitching of the two side panels of the lining. less – it is a long, straight edge after all, and therefore a classic candidate for machine stitching. But Joe finds that the speed of machine overlocking can lead to the line of the trouser being ever-so-slightly kinked, as the perfect line is lost in the speed of the action. The inside-leg seam is easier to distort in this way. 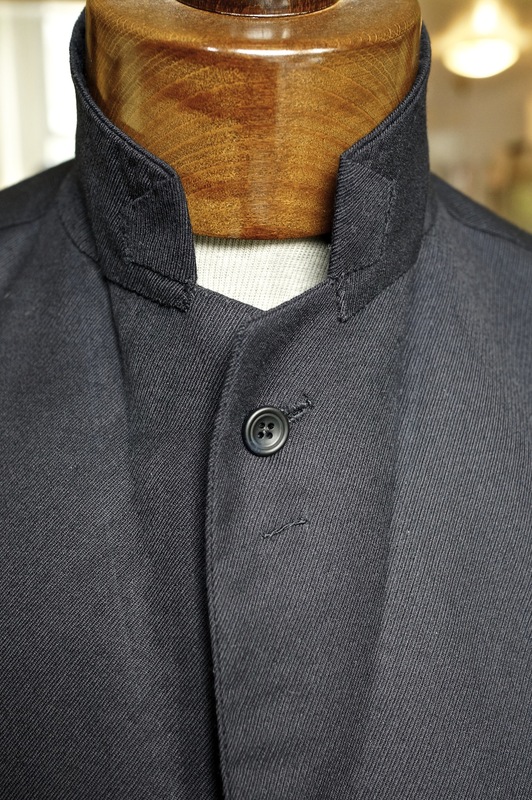 Extra work also goes into the gorge stitching (where the collar joins the lapel), with the two being stitched flat and folded over, rather than the two sides simply being pulled together. 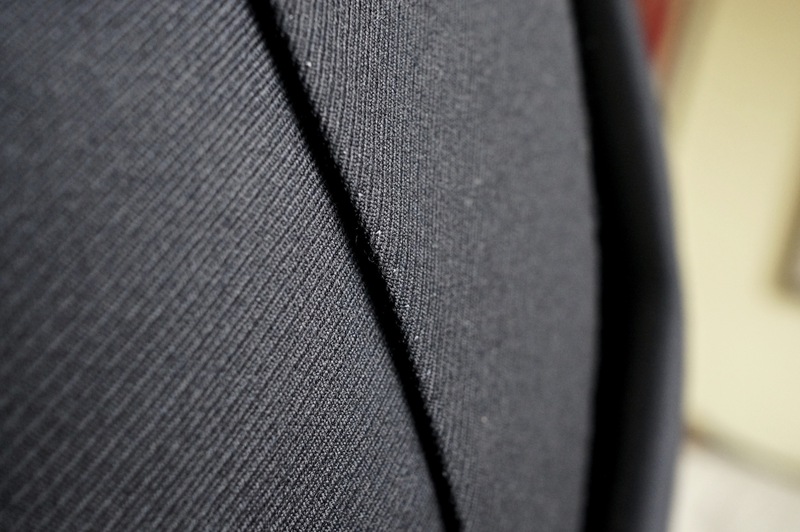 And of course the decorative details on this suit, such as the raised seam in the back of the jacket and lapped seams down the trousers, involve a lot more handwork. For a price to US customers (so ex-VAT) of £3333 for a two-piece suit, it’s very good value. And yes, they can do more conservative styling. The only thing I’m not entirely sure about is the position of the high-waisted trousers. They have to be high to wear with a waistcoat (otherwise the waistcoat is too long or you end up showing shirt between the two), but it still feels odd to have so many layers of cloth at my navel. I think I may end up lowering the waistband by about an inch – to the lowest it can go and still be adequately covered by the waistcoat. More from the C&M team soon. You can follow the discussion on Chittleborough & Morgan suit: Part 4 by entering your email address in the box below. You will then receive an email every time a new comment is added. These will also contain a link to a page where you can stop the alerts, and remove all of your related data from the site. Absolutely exquisite. Would love to see a full-length shot or two with the trousers included. Sure, will do that some time as well. Perhaps in a ‘how to wear it’ piece. Did you like the detail shots? I’m trying to do more of those, but in enlargeable thumbnails so they don’t dominate the post. The detail shots are great, and I appreciate that with a commission like this, detail will be the focus. C&M certainly are a standout on the Row. I agree with Patrick from what I can see the whole thing looks fantastic and the detailed shots are great. So C&M are the best makers on the Row for you that’s interesting as I was wondering who was. Also I assume that Mr. Ford took his inspiration from C&M the pocket tabs and the lapels the high waisted trousers etc am i right? C&M certainly the best finishing and make, yes. The suit looks amazing, would it be possible to post a picture of the trousers, so that we can properly see how they fall? This is a stunning piece of work, Simon! 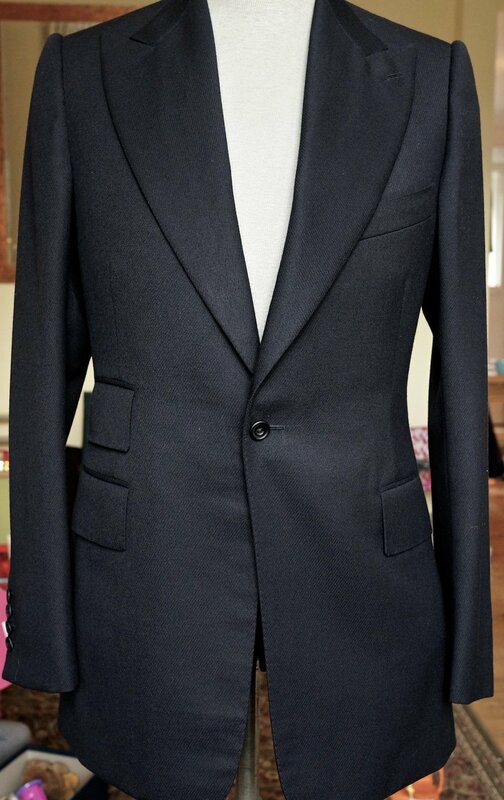 The lapels are perfect and really add some visual interest to this otherwise quite classic suit. Even compared to your other usually very impressive projects, this one really stands out! How does the jacket feel in terms of ease of movement? From the top shot it seems really tight around the arm holes. 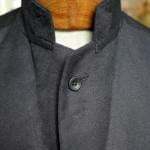 Additionally, with the waist coat having a proper collar, does it make a difference to the fit of the jacket collar? The ease of movement is the same as you’d get from any non-drape English suit. A&S etc will always be more comfortable, but messier, as will Neapolitan tailoring. Or even French, given the lack of shoulder padding etc. No, the waistcoat doesn’t make that much difference. It helps that the jacket collar is quite high and tall. But that’s what I need, given I have a relatively long neck. Great fit around the back . Not sure about that raised sean…..I think ‘quirky’ things like hat draw attention away from the jacket. I note you favour the peak lapel . When do think a peak is beeper than a notch. I personally am always reminded by the peak lapel as a jacket The Joker (from Batman) would wear ! Beautiful suit, and I love the close-up photos. It puzzles me as to why anyone would buy a Tom Ford suit when there are tailors like this who share the same inspiration and make something that best works for each individual. Wow – what a great suit. The shot from the back is amazing. The detail shots are quite good – a lot of times it’s difficult to see those in the overall shots. It would be nice to post a front shot – and maybe with the jacket open so we can see the waistcoat. You certainly have the best fitted suit on the street! This is a stunning suit, Simon. 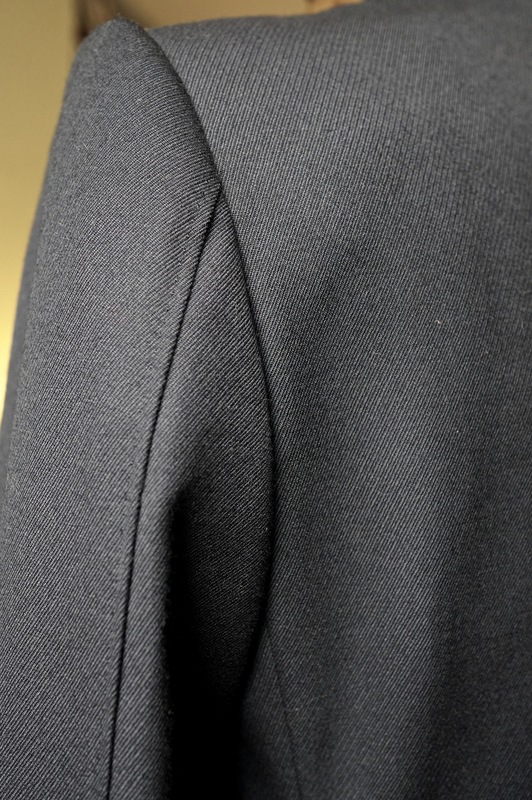 The details on the collar and lapel are amazing and I’m a fan of the raised seam on the back. I would echo others who want to see the waistcoat with the jacket. A question on C&M house style: is this jacket shoulder typical of their style or was this a request of yours. The fit around the back looks stunning – I particularly like the deep vents. The whole thing is very edgy. Would also love to see some photos from the front. Thanks, and also for your reply re: trees. Would you say C&M are rather tailors for the “advanced” in tailoring and not so much a first choice for a classic blue suit since the outspoken details are their “brand”? Wonderful suit, and that back is a technical marvel. It flows almost like water. I wonder what your opinion of it is with regards to “usefulness”? Generally speaking tailoring aims to smooth out any posture issues, whereas the sculpting here exaggerates any hollowness of the back and heavy curvature of the spine. Do you think it would be possible for C&M to make a deliberately less shapely coat or is it built into their DNA? Thanks Nick. They could make a less shapely coat, yes, but I wouldn’t ask them to. 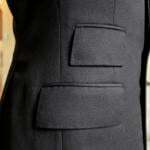 Many other tailors attempt to achieve exactly this shape, they just fail. The skirt sits on the bum, or pulls in the back. The level of tailoring is indeed extraordinary. However, I would have some doubts as to the cut / style. IMHO the cut should try to achieve to disguise and mitigate any “defects” of the body. That said, it appears to me that the jacket cut draws attention to your prominent seat and hollow lower back (as you mention in the article). Also, the cut as shown on the picture might seem to extravagant on a business suit (I understand that the suit on the picture is not a business suit). On a separate note, I find the blog marvelous. Please keep going. Lovely suit – I especially like the back and the rope in the sleeveheads – it’s gorgeous. Just one thing – I’m surprised with your cycling imterest and prominent seat you don’t opt for a single vent more frequently. Single vents work far better on a bicycle and help hide a prominent seat. 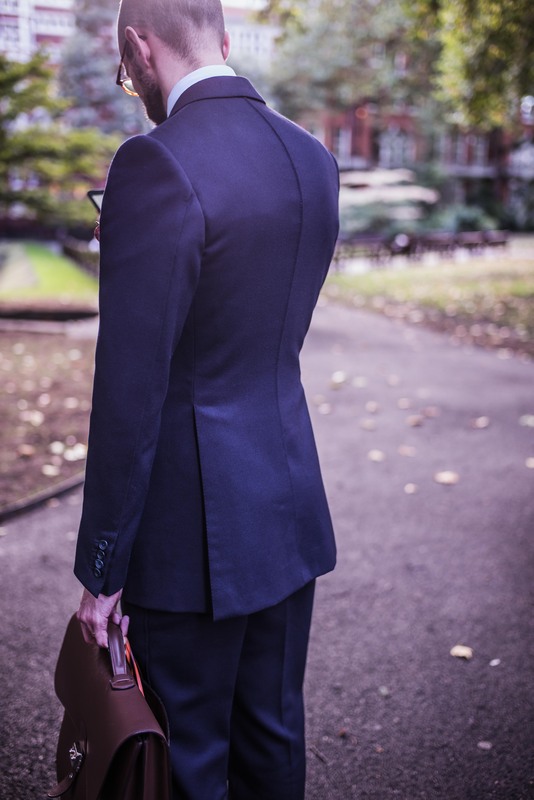 Not that it’s a problem here – the bottom of the back is beautiful and it’s hardly a suit you’d cycle in but just something to bear in mind when tailoring your style and choices to respond to your interests and shape. Also, I’m interested to hear your thoughts on colour theory and colour analysis and how it could influence people’s choices of material colour. I don’t really ever cycle in my suits, so that’s not much of a concern. And to be honest I find a single vent both less elegant and less able to deal with a prominent seat. The double vent covers it more effectively, if cut deep enough. I really like the high vents (almost up to the waist) on the suit jacket. It certainly adds some fluidity to the whole look. Do you think C&M is worth going for if let’s say I’m going for a more conservative look? I was just thinking since their house style are the wide, curved peaked lapels and a single button jacket. This is a fabulous suit. A complete work of art albeit probably not for moi as I’m a little vertically challenged (5′ 8″). But would like to know Simon’s opinion on the best house style for the less tall. Quick question: is the price point you quote in your article still up-to-date? Simon, the sharp lines and sharp elegance of C&M, in particular the trousers, are breathtaking. However, I wonder, how do you think C&M’s style would suit a “wider” gentleman? I think it could work well actually – often a wider man can do with more structure in order to redefine their body shape more. However, it wouldn’t necessarily look the same as on Michael, Joe or Francis of course. As you mentioned that this suit is made of 16oz Huddersfield Calvary twill, is the trousers half lined, fully lined or not lined at all? Please would you confirm pricing Simon? You state prices start at £3333 plus VAT for a two piece suit. When I emailed them they said a three piece started at £6,500! A big difference. Many thanks. This piece was a while ago, and many have gone up around the Row in recent years. I assume that 6.5 is with VAT, but I’d assume what they told you was correct. Many thanks Simon. Much appreciated. As I won’t be wearing my dinner jacket too often – and certainly not as often as any of my suits – I’m torn as to how much to spend on it. C&M and the likes of Micheal Browne are quoting £6,500 to £8,000, which is too expensive for me. So my question is this: do you think it would be better to get a bespoke version from the likes of Elia Caliendo, albeit in a softer Neapolitan style, or go RTW with an English tailor in order to get a more constructed style? If it’s the latter, which of the English tailors both on and off the row would you recommend for the quality of their RTW and then their ability to fine tune it to get the best fit thereafter? Many thanks in advance. 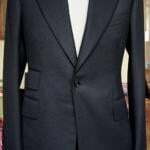 How about an English tailor like Kent Haste & Lachter or Steven Hitchcock? Or, if you don’t mind it not being made in England, Whitcomb & Shaftesbury? How would you compare and contrast Chittleborough and Morgan and Edward Sexton in terms of style and finishing as you have commissioned both? Hi Laurent. I don't think so, the brand dates back to Robert Bonnet I think. Hi Simon- Do you think the lighter Ariston Donegal would work as an odd (but smart) winter jacket in warmer climates, or is it a bit too crisp and works nicer as a full suit? Thanks. It makes sense, thanks! The problem is that I also want the pockets on the front and I don´t think Saman makes those on the half lined jackets. But I will talk to him about it.